Well after almost three years of waiting, the new Ray Walton Rolling Pin has finally arrived, albeit in very limited numbers. Having handled the Mark II version I can only conclude that this is a fantastic reel which is destined to become a classic. 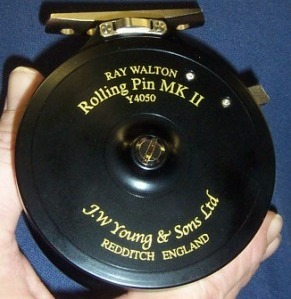 At approximately 3½in diameter, this special wide drum side-casting reel was designed (and improved) by Ray Walton for trundling luncheon meat for barbel, but is also ideal for trotting and stalking other species when used in the traditional way. 1. New shallow, fast tapered spool to allow better and more accurate casting. 2. New thicker hub with two ball bearings. 3. New push button locking/unlocking device. 4. New tapered handles. 5. New on/off ratchet lever on the front lip of the back plate for easier access. 6. New universal rod plate. 7. New hole design. 8. Lighter in weight - 8.5oz. 9. Stronger ratchet spring. 10.Silver and Gold in colour. Price £325.00 From Davis Tackle.Christchurch. Although this is a true centrepin you can forget the normal problems with casting this type of reel. (You will not need your great, great grandfather to show you the Wallis cast either). 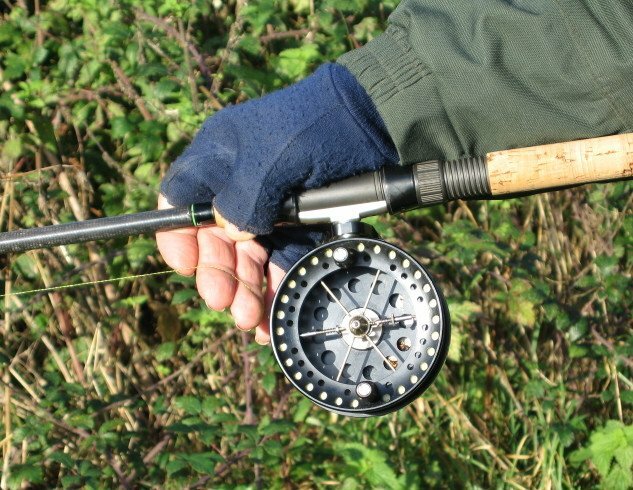 This side casting reel is designed for Barbel fishing in particular, because the drum can be swivelled 90 degrees either way so you can cast off the side of the drum without 30 yards of line dangling around your feet. Being an engineer I fully appreciate the design, precision and beauty of this unique reel. Several times whilst trundling fellow anglers have spotted the reel and have come nearer for a more detailed look. (my model is black anodised and is rarer than the normal clear anodised version). I use braid with this reel and have had no problems with line twist (which you can get with mono). I fully recommend this reel and hope to upgrade to the new J.W. Young’s model (which in corporates a drum locking mechanism) when funds allow. In the meantime I will stick with the mark 1 .....IT'S BRILLIANT!!!!. Chris (Sidecast) is showing the most comfortable way to touch ledger, which allows you to feel for the very sensitive bites without the need to watch the rod-tip for hours on end. Braid is also his choice of line with a breaking strain of about 15lbs.recommended.